Running Into The Sun make the announce about the ticket launch event just around 2 hour ago at their Facebook & twitter today. 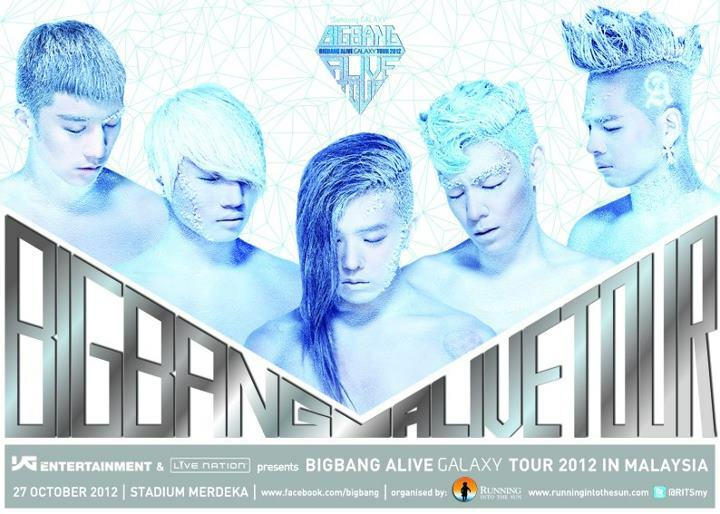 The ticket launch event of Big Bang Alive Galaxy Tour 2012 Live in Malaysia - at Fehrenheit88 on 28 July 2012 from 10.30 am until 6 pm. Fahrenheit88 will also be the only place that all MalaysianVIP can get VIP tickets (RM 688) & prioroty premiere Rock Pit tickets. Yes, there will be a ticket launch event for this concert. It will be at Fahrenheit88 on 28 July 2012, 10.30 am - 6 pm. 2. When will ticket be released? Tickets will be released on the 28th of July at 10.30 am at outlets and Fahrenheit88. Tickets will be released at 12 pm for Hotline and Online. 3. Where can I buy VIP tickets? VIP tickets can be bought only at the ticket launch at Fahrenheit88. 4. Can I choose my seat(s)? Unfortunately, you cannot choose your seats. You only can choose your category. It based on a first come first served basis. 5. How many ticket can I purchase? Each person is entitled to a maximum of 10 tickets only per transaction. 6. Is there any age limit? For safety reasons, children below 6 years old are not allowed for the seated Categories and 12 years old for the Rockpit categories. 7. Is there anyway possible that I am allowed to access the backstage to see my favorite boys? You may buy tickets on the Ticketing agents website when tickets are released on the 28th of July. 9. Are there any limit to what kind of tickets I can purchase? No, you can purchase tickets from any category. Age restrictions apply (please see point 6). 10. What are the 300 Priority Premier Rockpit tickets available at the ticket launch? The first 150 tickets for Premier Rockpit A and Premier Rockpit B will only be sold at the ticket launch. Customers with the first 300 tickets will be allowed to enter earlier then the rest in that category. 11. Does tickets prices stated in Seat Map include Tax? No, it does not. A RM 3 processing fee will be charged for each ticket. 12. Will you be able to change the date of the concert? No, this date has been set according to the artiste schedule. 13. Is there a wheel chair zone? Yes, there is limited number of wheel chair zone at Cat 4. 14. Is overnight queuing allowed? 15. Which ticketing agent should I go to for the various categories? 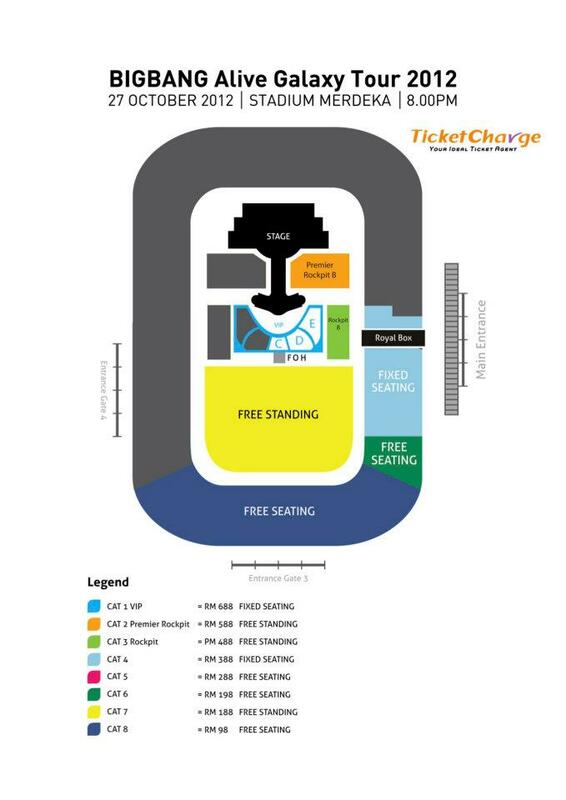 For the category of tickets available via Ticketcharge and Red Tix, please refer to their respective website. 16. How can I pay for my tickets? Payments can be made via credit card (Visa, Mastercard), debit card and cash at all outlets. 17. Where are the ticketing outlets? Please visit the ticketing website for a list of their outlets. Black market tickets will be strictly monitored and recorded on our end. We hope that everyone behaves in a socially responsible manner and not succumb to impulse to buy tickets from resellers who are seeking to exploit K-pop fans. If you proceed to buy any black market tickets, do note you might be asked for ID check at the door, and RITS reserves the right to refuse entry at door. 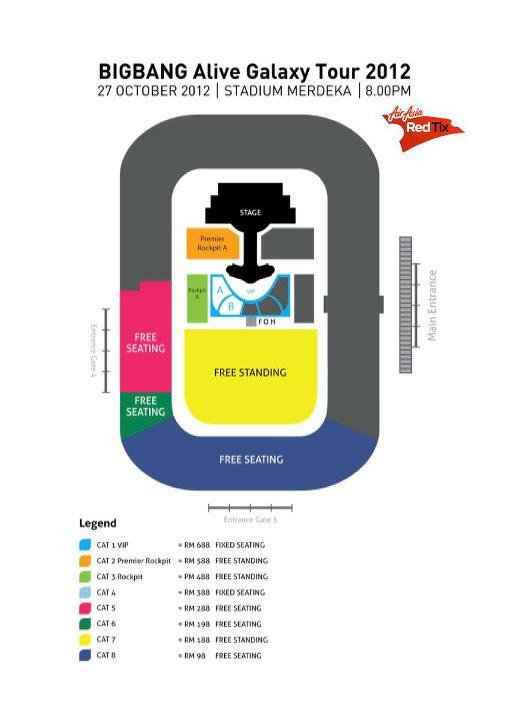 So to all Malaysian VIP, you guys can see this seating plan for you guys choose the concert's ticket that you guys really want to buy... (^_^) For me - I already want to buy VIP ticket that the price is RM 688 & this ticket only can buy at Fahrenheit88 Bukit Bintang.